But it doesn’t really matter only if “do as I say, not as I do” has become the credo of Gore and his fellow climate change alarmists. 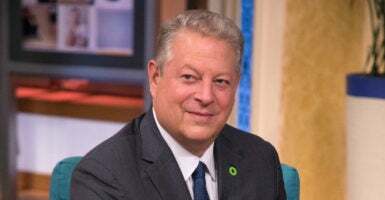 The size of Gore’s carbon footprint has become an issue with the Aug. 4 theatrical release of “An Inconvenient Sequel: Truth to Power,” the follow-up to “An Inconvenient Truth,” his 2006 global warming horror film. Inconveniently for Gore, the sequel is bombing at the box office after receiving mixed reviews from film critics and moviegoers alike. The new film has grossed a meager $2.3 million domestically as of Aug. 13, according to Boxofficemojo.com. As the foremost Chicken Little of the movement warning of impending doom from the burning of fossil fuels that will supposedly cook the planet if the world doesn’t act faster and more furiously to rein in carbon emissions, the former vice president should be leading by example in reducing his own energy consumption. Yet, according to a report earlier this month from the National Center for Public Policy Research, “Al Gore’s Inconvenient Reality,” the former vice president is still living la vida loca at his Nashville, Tennessee, estate. While warning of the dire consequences if the rest of us don’t urgently dial back our energy consumption, Gore has not made those same sacrifices himself. According to the report, compiled from public records requests and information from the Nashville Electric Service, Gore’s 20-room, 10,070-square-foot, Colonial-style mansion consumed an average of 19,241 kilowatt-hours per month—more than 21.3 times that of the U.S. household average of 901 kilowatt-hours monthly. Last September alone, Gore’s home in the toney Belle Meade section of Music City consumed 30,993 kWh, as much energy as a typical American family uses in 34 months. The mainstream media—which has fully bought in to the climate change hysteria and steadfastly refuses to report the findings of any inconvenient studies that run contrary to the narrative—studiously ignored the findings of the National Center for Public Policy Research. That’s what makes the New Republic’s rejoinder, “Al Gore’s Carbon Footprint Doesn’t Matter,” so curious. Rather than simply joining the mainstream media’s conspiracy of silence, Atkin blithely dismisses the report’s findings as irrelevant. This poses a dilemma for Atkin, who then says we should “set aside the dispute over Gore’s carbon footprint” in favor of a discussion of the “bigger question” of whether prominent climate advocates should be “expected to live a carbon-neutral lifestyle” and whether they’re hypocrites if they don’t. Atkin contends that climate change activists who don’t live “carbon-neutral lifestyles” aren’t hypocrites because “for the most part, they’re not asking you to live a carbon-neutral lifestyle” (emphasis added). Oh, really? Does Atkin expect us to forget that in January 2008, President-to-be Barack Obama warned that under his plan for a cap-and-trade system for greenhouse gas emissions, “electricity rates would necessarily skyrocket,” because utilities would face expensive retrofitting mandates, and that those costs inevitably would be passed onto consumers? But for the average American, it would greatly affect whether they could continue to live their lives as they please.